The recently launched editing and consultancy company Cofactor has released a free, online tool to help scientists choose the most appropriate journal for their paper. The Cofactor Journal Selector Tool is available at http://cofactorscience.com/journal-selector. 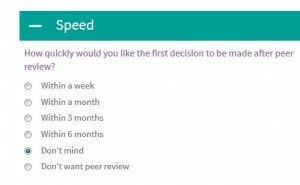 The Cofactor Journal Selector Tool asks 20 questions on topics such as subject area, peer review type, open access status, publication charges and speed of review. It then narrows down the list of suitable journals according to the answers. Users can experiment with different preferences to see how they influence the recommendations. The tool will be particularly useful to authors looking for a journal with a broad subject scope. This includes high-impact journals such as Nature and Science and also ‘megajournals’ such as PLOS One. Megajournals are a relatively new class of open access journal that select papers only on the basis that the science is sound, not on potential significance. All broad scope journals are included in the Cofactor Journal Selector Tool database, and more specialist journals are being added on an ongoing basis. The tool currently covers medicine, biology and physical sciences and future versions will broaden out to other subject areas. The tool was well received at the recent Futurepub 3 event hosted by WriteLatex in London, when Anna Sharman presented it to an audience of scientists, publishers and technology companies. Anna Sharman has written a post on the Cofactor blog introducing the tool. Cofactor Ltd is a company registered in England and Wales (Company no 8764127). It was launched in June 2014 by Anna Sharman. Cofactor offers training and consultancy about scientific publishing and editorial services for researchers, with the aim of helping them publish their research more effectively.